It's time to talk water. Specifically, "Harmonized Water". 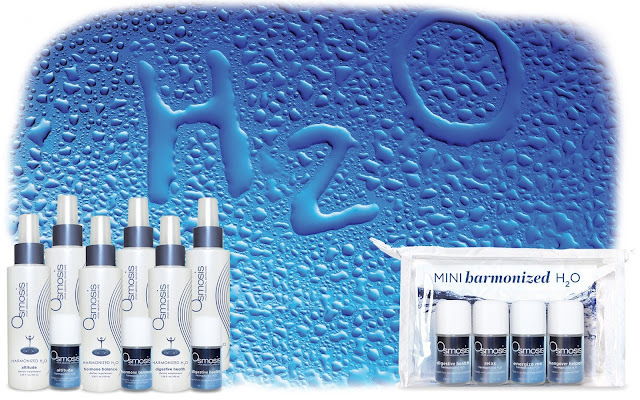 We are all super excited about the new "Mini Harmonized H2O Kit" by Osmosis Skincare. This little kit is the perfect way to get started on Harmonized Waters! It features four mini bottles of the most popular Harmonized Waters. These are great little internal wellness supplements that address various conditions and concerns. Harmonized water is a combination of waters that contain different vibrational frequencies. Unlike structured water, which addresses the tendency of water molecules to cluster together, harmonized water describes the frequencies that water carries in its proton/electron outer shell. Water has the ability to carry “frequency messages” for extended periods of time and we have found that some of these messages harmonize internal imbalances in our body. How do frequencies affect the body? There are several studies that show the positive and negative effects of different frequencies in our environment. A common frequency that is put off by many electronic devices is 60hz. In excess, which is almost unavoidable in today’s electronic age, it has been shown to affect the immune system amongst other things. In contrast, studies show that 10hz has positive effects on the brain and relaxation. The reality is that every cell in your body (and everything in nature) has its own unique frequency, very much like a fingerprint. Your body functions by communicating messages through this energetic pathway. It seems odd to think that an antibiotic or an herbal supplement likely function by emanating their “frequency essence” rather than actually mechanically “unlocking a receptor”, but that is likely the case. That would explain what has never been explained; how do small amounts of herbs/drugs magically find their way to “the problem area” in our body after ingestion? It is the equivalent of dropping a blind/deaf/mute person in the middle of New York and asking them to find an address….and yet they do! Just as a tuning fork makes specific substances vibrate, frequencies only impact other frequencies in that spectrum. How long does it take to notice the effects of Harmonized Water? Some people notice it immediately; others can take up to ½ hour to feel the benefits. The effects can be quite subtle or significant depending on the day and the individual. How long can the effects last? The frequencies will usually last 3-4 hours. However, the balancing impact can last for several more hours which is why twice a day is usually all that is needed. How does it compare to other frequency enhanced waters? There is little evidence that any of the handfuls of claims of frequency enhanced waters actually maintain their frequencies. In addition, most waters are not actually frequency enhanced with beneficial frequencies. By definition, frequency enhanced water could be enhanced by being; “prayed over”, “put next to music”, “treated with light”…because all of these methods emanate frequencies. You will find that Harmonized Water is different. How does it compare to structured or ionically treated water? There are ionization treatments out right now that make water either more acidic or more basic. The basic (alkaline) water is good for you because almost all of us are too acidic (from sugar, stress, protein excess, etc) and it will help neutralize that acidity. Harmonized Water is different. Structured water can also be beneficial. It is the process of breaking down larger clusters of water into smaller ones under the theory that cells can only absorb small clusters and therefore the hydration is superior from microcluster/structured water. I think there is validity to this process as well. Unfortunately, the effects of structured water are temporary and likely to “re-cluster” by the time consumers get these beverages at the store. Harmonized water enhances the outer shell of the protons/electrons of all the water molecules and its effects on water molecules lasts for several years. Will I always feel “something”? We have found that not everyone is as aware of his or her body as others. In addition, some of us have “noise pollution” where we are overwhelmed with disharmonic frequencies and so the beneficial frequencies are less impactful. However, the overwhelming majority of consumers will notice obvious benefits. Most people think more is better. Even though you are only using 2ml, the average dose, it is packed full of frequencies. People weighing over 170 lbs may need an extra 1ml for best results. Kids under 100lbs may be able to take a half-dose. While it is true that some people will respond better with more, most will find the 2ml dose to be perfect. Occasionally people have mistakenly taken the whole bottle. This may cause some diarrhea for a few hours depending on the formula but in most cases it will not have any significant impact on the body. For more FAQ and research on Osmosis Harmonized Water or to tell us what you think of Harmonized H2O, contact us at customerservice@beautystoredepot.com.